What are the responsibilities for the States? This report analyses reporting activities improving public transparency and the main mechanisms of exchange of information. On one hand, public transparency is needed to guarantee States’ accountability over their arms transfers. Through relevant and regularly published information provided by the government, the parliament, the citizens and the members of the civil society are aware of its activities in arms trade and can verify if it respects its national, regional and international obligations. A clear commitment from the government towards public transparency is a sign of the democratic health of a country. On the other hand, mechanisms of exchange of information set up within the European Union, the Organization for Security and Cooperation in Europe and the Wasenaar Arangement have opened spaces for discussion and interaction between States and allowed to establish minimum standards of transparency. The United Nations Register of Conventional Arms has contributed to the legitimacy of the practice of information sharing. It is also a unique source of information on international arms transfers. 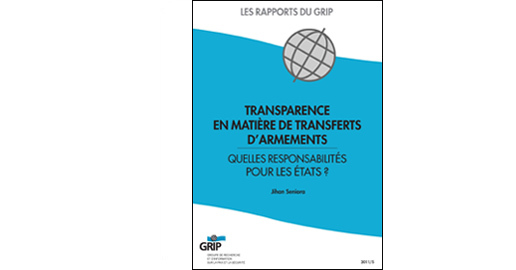 The degree of States’ participation in these various instruments constitutes a good indicator to evaluate their attitudes and perceptions concerning transparency and the arms trade. Indeed, it currently seems that certain States are still reluctant to participate into transparency instruments. They feel that these instruments hamper the culture of confidentiality and secrecy which they see as the most efficient way to defend their interests. Other States only conceive information sharing as a means to “get bonus points for good international behavior”2. To deconstruct these false perceptions, we must highlight transparency as a means toward essential ends such as improving peace, security, and democracy. We must promote transparency as an individual and collective practice, allowing, on one hand, for an inner work against administrative and political inertia and for increased intra-cooperation and, on the other hand, improving cooperation and building confidence among States. Transparence en matière de transferts d'armements - Quelles responsabilités pour les États?